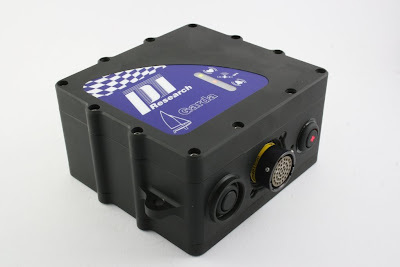 I was approached recently by the guys at Cosworth about testing their new PI Garda GPS sailing system, and providing them with some data they can use. I’ve come across the PI kit before in my work with Skandia Team GBR, and Victory Challenge, but I’ve not seen it used on anything quite as small as a Moth. I’ve now had it on the boat a few times and should be able to publish the data here soon. The Pi Garda system from Cosworth Electronics, is a sophisticated GPS linked to wind gear that records and analyses a lot of interesting factors such as wind speed and direction to produce key performance measures such as VMG and polars along with standard tracking data. 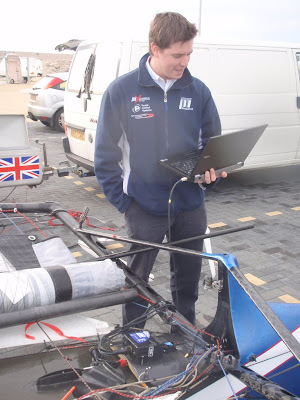 On top of this the analysis software used can do a variety of analysis tasks such as; automatic tacking and gybing analysis and layline & startline tools, all synchronised with relevant video. I’m still learning about all the different features that can be done, analysed or added on in the way of sensors or custom fittings. Strain gauges, rudder sensors and inertial measurement tools have all been mentioned, but to start with I’m sailing with a system that has the ‘black box’ GPS, with an IMU giving me heel and pitch angles, all linked to some Raymarine wind gear mounted on the bow. Testing has begun – so technical minds out there – what data would you be interested in? Data I’ve got so far to be posted soon. About Cosworth Electronics: Cosworth Electronics’ pioneering technologies heralded a turning point in racecar innovation, helping to create champions in Formula 1, IndyCar, and many more. Now their marine division are looking into the world of performance sailing, including Americas Cup Syndicates, speed record challengers and Olympic sailors. Hi Adam, pretty cool to see this happening on the moths. I'd be very interested in a set of upwind targets which could be used to help refine the onset flow conditions used in our CFD. IE best TWA, Vs, Heel Angle & Leeway for a given TWS. It would be interesting to see the range of modes upwind and downwind too. IE difference in VMG between high and slow upwind vs low and fast and of course the opposite downwind. One other thing, the effect of weather heel on Leeway. I think the most interesting/useful piece of data you could collect would be to measure the actual force on the foils (in the direction of the strut). How you achieve this might get a bit interesting. A Shear pin in the CB would work but you would loose a bit in friction. Ideally a flange on the CB with pressure sensor on the hull. The rudder I think you could do with a tensile/compression strain gauge within the lower arm of the gantry. Knowing the real numbers for he amount of lift from each foil when you are going fast will help drive both foil development and boat setup. Before it becomes available in small boat form at a price needing a second mortgage, I would like to propose that the Moth class ban any more electronic gatgetry for racing. I only raced with it at the weekend to collect data that is to be shared openly. 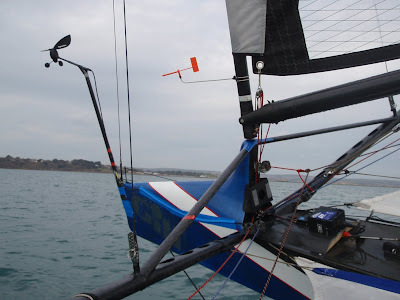 Besides the cost, the weight and windage of such a system that does not give you feedback on the boat in this form, would naturally limit the use by most for racing at the current time anyway. Given that all the current GPS' in use can do most of the data logging & tracking functions - do you propose the use of wind gear is a step too far, and that is what should be restricted for racing? That would be an easy enough rule to add to sailing instructions, and not effect the fleets current use of gps systems. Wow - pretty high tech. I'd think capturing details of the wand position might be a useful set of data as would helm position. I second Alan's suggestion, with the possible addition (just to make it even more challenging) of a vertical component sensor on each foil to measure the lift and drag from each foil in real time. This sort of instrumentation has no place in a regatta but as a design tool it would be very useful. I was against GPS devices in 2005 when they appeared and I spoke against them at the AGM in Melbourne, but lost that battle and expect to loose any future one. But the class has to preserve its racing. Bladerider and others have in the past few years sold a huge number of moths, but a relatively smaller number have started and continued to race in IMCA events. If those who find racing is too hard and keeping up the pace is too expensive, then the moth is in danger of becoming a novel beach toy and not the racing boat we enjoy. I do not want to see moth racing out priced for the market. Already since 2005 GPS and new boat costs have doubled, and now with the financial crisis there are probably too many builders for the discretionaly dollars. Its time to minimise costs to potential new moth racers. How a rule would be worded could be copied from other classes. The most expensive aspect of sailing moths is time needed for sailing and for development. That's not going away any time soon. Nor should it. If you don't like to spend time sailing or developing your boat why would you get a Moth in the first place? Expensive electronics are largely a distraction when racing so let anyone who wants to have them have them. Why do you think two boat campaigns have been the norm for the Volvo or AC? Let the engineers have some fun. International Laser sailing requires massive budget today. If someone wants to invest in electronics let them. Unless they can also afford a team of good engineers to analyse the data it will not help much if at all. Thousands of people cough up huge dollops of cash for racing bikes or triathlon bikes without flinching. the system looks absolutly awesome. This seems to be a really nice gadget for our senior sailing group. Can u poste pls some additional pictures of the assembled sensors? We plan to to buy the system but we need more information how the sensors are attached. 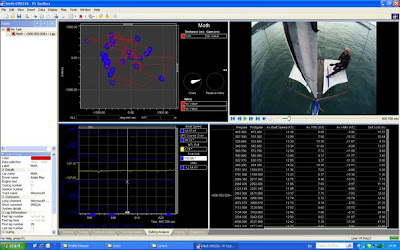 On the software screenshot I see a lot oft tabs... what else can you measure than the boat velocity? Is it possible to measure the forces which affect the mast? What is the weight of the system, and where ist the battery :-) ? You are able to plug in virtually any sensors into the system. The battery is internal. You can measure several things via strain gauging, however these are additional to the standard package. The weight of the box is 500g. If you contact me at Alex.Reid@cosworth.com we can discuss your requirements further.